The TBMA was formed in 1990 as an association of individuals who have similar interests in the unique form of music known as BLUEGRASS . It was established to convey a very basic understanding relative to policy, practice and procedure to provide the means of effective cooperation through amicable discussions and adjustments of matters of mutual interest of the association and its membership. The TBMA encourages sincere BLUEGRASS music aspirants, young or old, novice or professional, to fulfill their aspirations by aiding in their development to include the showcasing of their talents. TBMA's actions are regulated by established by-laws that are the fundamental laws and principles by which it is governed. These bylaws have been written, attested, and ratified by the Board of Directors. The TBMA is an incorporated, non-profit Association with a Certificate of Incorporation issued through the office of the Virginia State Corporation Commission. The objectives of the TBMA are to promote, preserve, protect and to perpetuate the unique art of BLUEGRASS music. These objectives are obtained through competence in sponsoring, directing, and presenting periodic concerts that provide avenues for businesses and other organizations to market their services and products. To be eligible for membership, you must be at least 18 years old and have at heart the interest of TBMA as defined. (An Individual Membership is $20 annually, and a Family membership is $30 annually). 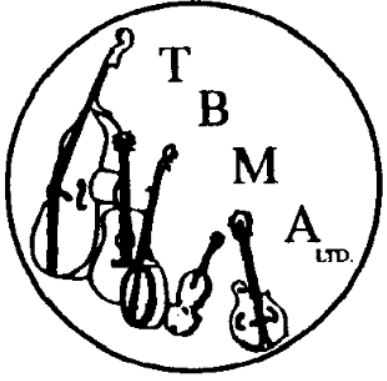 As a member, not only will you be supporting TBMA's activities, but you also will receive a membership card, be able to attend all concerts at a reduced rate of $5.00 per member, be invited to actively participate in all TBMA activities, and you will receive a monthly newsletter to keep you informed of what the TBMA is doing at any given time in its continued promotion of BLUEGRASS music. TBMA's concerts are held on the 4th Saturday of each month at Jukebox Live 4592 George Washington Hwy, Portsmouth, Va. 23702 (in the Williams Court II Activity Center, between Catherine’s Cafe and Dollar General) and start at 7 PM. You are invited browse the TBMA web site to check out the bands' schedules, up-coming local events, contact information for board members, and find links to bluegrass websites of all kinds. The TBMA expects to have continuity through interested individuals like you who are willing and able to give of their time and talents and resources. Help is needed after each show to stack chairs and take down tables. It is asked of all attending members, if you are physically able, that you stay and help. Join the TBMA today! Please make your check payable to Treasurer - T.B.M.A.